The Devi Makes Three still makes the banjo sound fresh. 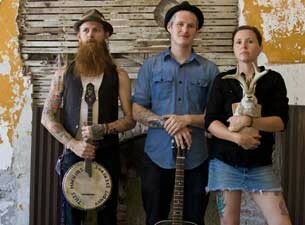 The Devil Makes Three are old-timey bluegrass rebel-rousers. They make this music that’s eerie and bootstompin’ fun. They pair well with a glass of whiskey, neat. Tonight, the three-piece comes to the Knitting Factory tonight along with Miss Lonely Hearts. Show starts at 8 pm and is $20. Read our interview with the folk-act here. Americana is that genre so-called country music-hatin’ folks can feel safe listening to — it’s still folk-rock enough to trick people into believing they’re not listening to country. Singer-songwriter Jeff Crosby bridges that gap easily enough, never going full country (no twangy vocals here) or rock in his recent release Waking Days. Together with his band the Refugees, Crosby creates spaces and textures you’ll want to sit and sway inside of. Born in Donnelly, Idaho (population 152), he now moves between L.A., Nashville and Boise when not out touring the country, which he’s done for the past 10 years. Crosby brings his road show to John’s Alley in Moscow tonight. Show starts at 9 pm and is $5. The Bartlett Awards — nominations were only open to shows that have transpired specifically at the Sprague Avenue venue over the past year — are announced tonight in a come-as-you-please ceremony at the venue that’s free and all-ages. Performing bands are Jan Francisco, Scott Ryan and Bandit Train. Show starts at 8 pm. Continuing Friday and Saturday is the Lantern Tap House’s Winter Beerfest. Friday night the entertainment is DJ Lydell and Saturday sees Marshall McLean Band closin’ out the festival. The self-titled record starts out slow and simmering, building layer by layer. Finally, Jack Dunsmore’s screaming vocals emerge from the grungy abyss, pulling the music into full-on dark metal territory. Things are about to get good and dark this Saturday at Dark White Light’s album release show, when their genre-bending music grinds out from the Observatory’s stage (the recently opened venue clearly focuses on getting the best sound possible out of its small quarters). The first 50 patrons through the doors receive a lyric ’zine with CD purchase. The show starts at 9 pm and is free. KYRS is having yet another benefit show, this time with awesome local punk acts Itchy Kitty and Phlegm Fatale taking over the Big Dipper with their steadfast screaming sounds. Punk rockers the Bight also performs. The show is $5 and money goes directly to the radio station. Saturday night, the Bartlett celebrates two years in business. Local acts Pine League, Von the Baptist and Wild Pacific help ring in yet another year for the venue. The show starts at 8 pm and is $5. The venue recently announced they're bringing in Waxahatchee in March, we'll see what other happenin' acts they'll attract next. See the other weekend music happenings here.